Better shape up! A masterclass in on-trend skirt styles and how to wear them. If you’re slender, a form-fitting pencil skirt will make the most of your assets. For a casual-chic approach, pair with a tucked-in T-shirt, or for a more formal look for the office, team with a feminine blouse or a man-style starched shirt. 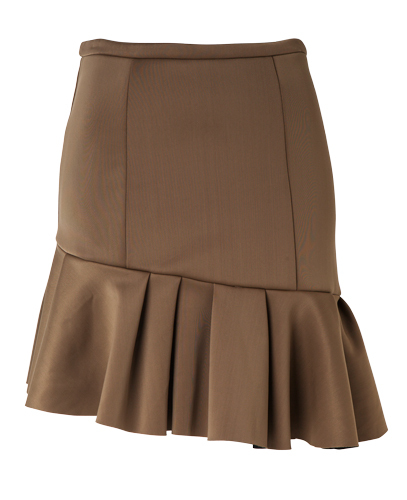 A-line skirts are extremely versatile and can be worn short or long to ultra-flattering effect. An elongated A-line denim skirt such as this is perfect for a curvy frame as it flatters the hips and bottom, the stiffer fabric streamlining your silhouette. Cinch your waist with a belt for a final feminine touch. A-line skirt, $279, Tanya Carlson. Mid-calf midi skirts might be on trend, but they have a pleasingly old-fashioned sensibility. They suit both slim and curvy shapes but are particularly great for taller women; if you’re on the short side, wear with heels. Box pleats help the skirt to skim over the hips – balance any bulk with a fitted top. Midi skirt, $265, Julian Danger. Ankle-length maxi skirts suit most body shapes but can overwhelm a short frame so are best avoided if you’re lacking in the height department. Choose a lightweight fabric to maximise movement and team with a top in a similar material, tucked in to define your waist. Maxi wrap skirt, $229, Isaac + Lulu. Similar to the A-line, this style drapes from the hips. It’s perfect for those with petite frames who’d like to amp up their curves. Stay current by going for a fluted-edge hem or a high-low hem that’s shorter at the front of the skirt and longer at the back. Flared skirt, $179, Staple + Cloth. Fitted around this hips, the flip skirt flares out above the hemline and is designed to maximise your curves. Minis such as this work for both day and night. Go for a block colour to offset the ‘busyness’ of the frill. Flip skirt, $110, Seed Heritage. From the editors of NEXT.